‘I found these quinces in a bag on someone’s front lawn on the outskirts of Seaford.’, did she write. I have quince sharing stories too, and a dream to tell about. I found the introductory quote in a blog entry published last weekend by a British woman who lives in Los Angeles*. I checked: there is no Seaford in California, so she probably wrote from UK’s East Sussex, or, more likely, she collected her quinces an other year. I spontaneously thought Sophie James was talking about Seaford on the South Coast of England because there is a tradition in the UK of sharing excess fruit by leaving some on your doorstep. I have heard of it several times since I have started to talk about local fruit with people four of five years ago in this country, and I know it is still happening in the neighbourhood here in Southfields, South West London, as in many other places probably. Unfortunately this tradition has been partly lost. Some people say that it was common thirty of fifty years ago but that it has disappeared. I personally have seen a box of fruit left in a front garden only once, yet I must say I don’t look for them, and we live in a street with few fruit trees in the back gardens. Still, we see so much unpicked fruit around that it sounds true. And speaking of quinces, this sought after fruit you don’t find in the shops, I have seen one tree with probably more than twenty kilograms on it this autumn. The quinces are now rotting on the ground. I could see the tree every time I was taking the train to Central London, contemplating with some kind of despair the slowly unfolding story of the loss of this golden resource. I want to stay optimistic, behaviours are going to change, and these easy-to-pick quinces, on that small low tree, won’t be lost next time. I would also like to say that I hope using and sharing local fruit will not be popular again just because of necessity, or because of the need to feel better about waste. To me we shouldn’t eat local fruit because some can’t afford to buy fruit in the trade, nor give it away just because it is a convenient way of disposing of it. We should do it because it is just good and sensible to eat local fruit and share surplus. It is not the first year that I and other people from the local community benefit from the generosity of a quince tree owner in South West London. 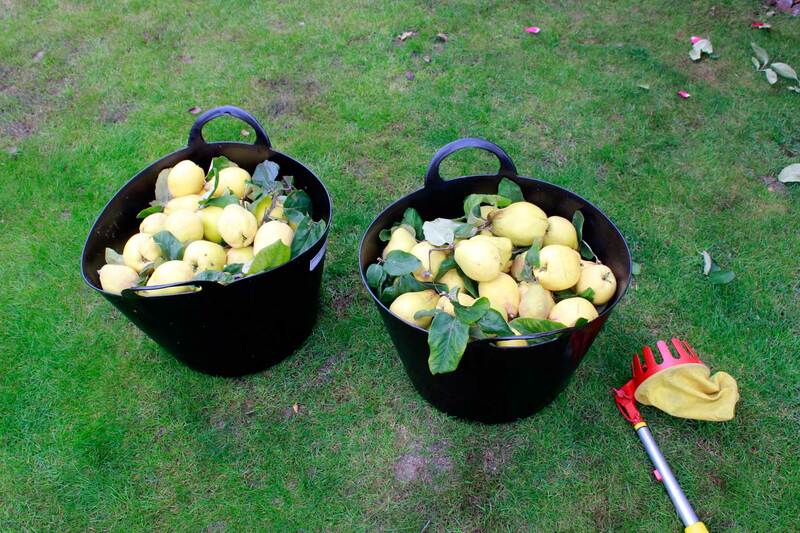 In 2010 for instance we were invited by a lady in Wimbledon Village to pick surplus quinces in her garden, and part of the video embedded in the first post of this blog was filmed there. This autumn, I picked quinces in three different occasions. 408g and 128g quinces, from two different trees, probably one grafted and the other non-grafted. Picked in a private garden in Raynes Park on 30th Sep and on a South West London hospital’s premises on 10th Oct. Photo 24th Nov 2013. 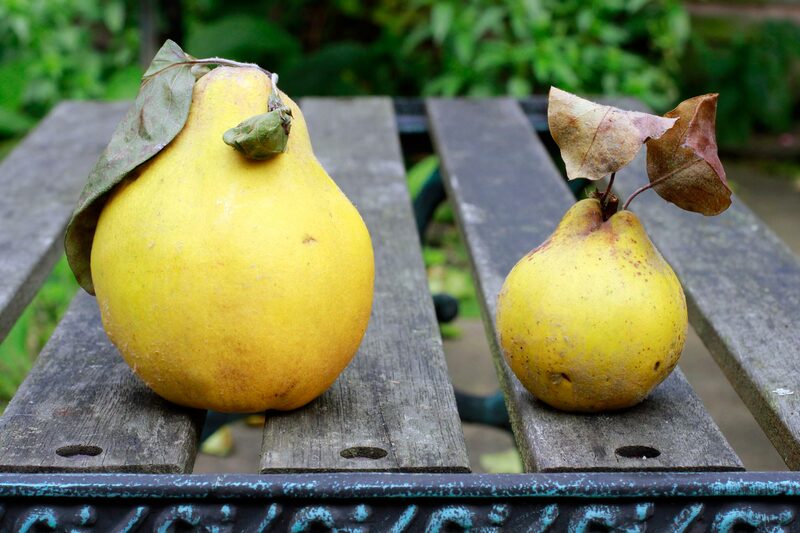 Story 1: On Monday 30th September morning, Gilli, Brian and myself harvested 40 kg of large quinces in the garden of a retired Londoner, a friend of theirs. 40 kg of large quinces in Raynes Park. Photo 30th Sep 2013. – I kept eight kilograms, which are still in our living room, ready to be cooked. – Five bags of three kilograms were given to members of the Abundance Wimbledon and Abundance Southfields networks. – Seven bags of two to three kilograms were collected at our home by members of the Streetlife network living in and around Southfields, by appointments following an ad I published on the Streetlife website. Story 2: On Thursday 10th October, we picked around twenty kilograms of small and very fragrant quinces in St Helier hospital in Carshalton. This was five miles away from my home, an unusual long distance to reach the fruit we aim for. I kept most of the fruit, made quince jelly and shared around eight kilograms of raw quinces at the first event organised by the recently established Abundance Southfields on Saturday 19th October afternoon. I must say that we lost a few kilograms of the small quinces: I was quite busy in the past two months and didn’t find the time to process the rest of them. Some started to rot and we threw them away. Interestingly, the large quinces kept well, only one of them has been lost, the others are still in perfect condition. December should be a bit quieter, I intend to make more jelly and some membrillo. On Monday 2nd December I am going to join Gilli and Brian for a coffee. It will be the opportunity to give them a jar of quince jelly and a jar of an other jam made with local fruit – I haven’t chosen which one yet – for their friend who kindly gave us access to his quinces. I hope he will also read this article and like it. Of course I will bring a jar for Gilli and Brian as well. Story 3: The third time we collected quinces was in the garden of a church near Gilli and Brian’s house. I was driving them back home when we saw the bright yellow quinces on the tree. Gilli called to get permission to pick, as she had done for St Helier. There as well she had seen the quinces from the car. In fact it is amazing how many fruit you can see when you start looking around! In that church garden we collected only four kilograms of small quinces. It took a quarter of an hour to do so, including parking the car, chatting while putting our wellies on and walking towards the tree. It had just rained heavily, but then the sun started to shine, and later on we joined other people to pick apples in various places during a wonderful afternoon. I remember this perfectly ripe Orange Pippin I bit into in this large greenfield in Raynes Park, one of the best apple varieties to my taste… Good memories! I would have liked to pick these quinces I saw from the train, which have now almost completely rot and disappeared into the ground. This would have made a good 4th story. They were large ones, I would have posted a new message on Streetlife, or found an other way to give them to the community. Hopefully it will happen next year, if there are quinces again on that particular tree. An even better scenario would be that the garden owners would leave a box of quinces on their doorstep for the neighbours to help themselves, or would contact Abundance for us to collect the fruit from their door. This way privacy would be even more respected. We could also lend them fruit picking poles, and of course would help them harvest if they asked. At the same time, Carshalton people could pick the wonderfully flavoured non-grafted small quinces from St Helier hospital, rather than us driving five miles to go there. This would be in a better world. I hope people join forces to make it happen. * Sophie James. Her blog entry about quinces: ‘Ripe’, 23rd Nov 2013, ‘Stories from the Stove’ blog (accessed 30th Nov 2013). This entry was posted in Fruit for sustainable development, Share, Stories and tagged Carshalton, Quinces, Raynes-Park, UK by Les Jardins d'ici. Bookmark the permalink.